UGC : What is it and why use it? User Generated Content (UGC) is, quite simply, any content created by the customer. Photos, videos and even reviews are all classed as UGC! Whether you’ve been struggling to gain engagement, want to connect more with your customers, or simply want to give your social feeds a refresh – it might be time to consider using UGC within your social media strategy. For a brand, sharing UGC is a simple and effective way to create authenticity and trust with the customer. Impeccably shot and styled high-res images might look great on your website, but can quickly get lost amongst a sea of unattainable and unrealistic imagery on social media and there’s a good reason for this. Relatability. According to a recent survey, consumers are 2.4 times more likely to see UGC as authentic, compared to brand-created content. Just think, when scrolling through your Instagram feed, are you more likely to stop and double tap for an overly airbrushed model shot in a studio, or someone who looks like you, your best friend or your co-worker? We know which we’d pick! We’re not talking #spon, #ad and paid collaborations, the best use of UGC is when it comes directly from genuine customers, no matter their social status or following. Customers haven’t been paid to promote the product, they’re sharing because it’s something they genuinely love – and that means a lot. In many ways, seeing someone post about a product or brand is the same as reading a positive review of a product or service. Using UGC within your social strategy is also a brilliant way to curate a variety of content. A brand may only have a limited number of photoshoots or design time, especially when budgets come into play but, with customers constantly sharing, UGC opens up a whole new world of content! One of the most common uses of UGC is a simple regram of an image to a brand’s Instagram account. Instagram Stories are also the perfect place to re-share your tagged posts and customer Stories. Instagram Stories already offer the opportunity for brands to showcase a more authentic side, so combining this with content from the customer only makes sense. Consider creating a highlight specifically for sharing UGC, that way it’s always available for customers to look back on. It’s not just Instagram though. Brands are frequently sharing customer content via Facebook and Twitter, as well as in email marketing and on their websites. Of course, when sharing someone else’s content, it’s best practice to ask permission. A quick DM requesting to share and ensuring credit is given goes a long way and, the majority of the time, the original poster will be more than happy to have their content shared. If you want to reap the rewards of UGC, make it easy for the customer. Be sure to make any hashtags and social handles visible in your social media bios, as well as online and, if applicable, in stores. It’s not uncommon to find hashtags displayed on labels, menus, bags, store windows and even in changing rooms! When browsing online, you’ll have no doubt come across Instagram galleries on retail sites, pulling in a brand’s tagged Instagram images, or content from a specific hashtag. 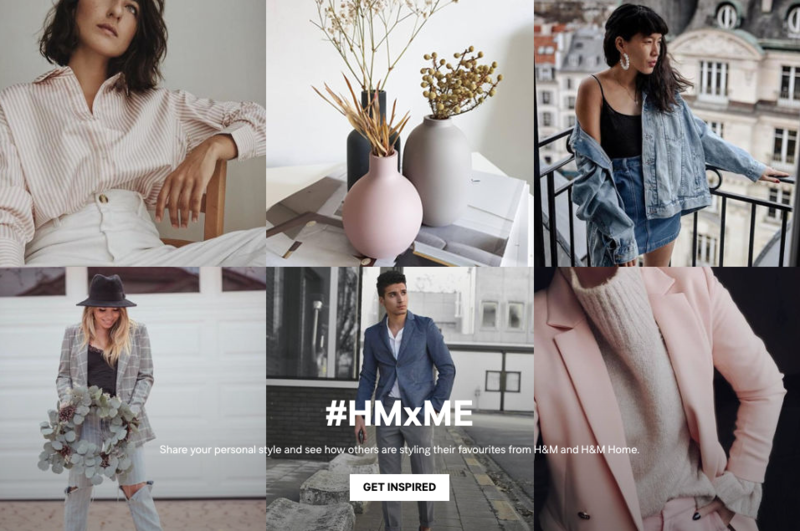 High-street fashion brands do this particularly well – think Topshop’s #TOPSHOPSTYLE or H&M’s #HMxME – but it’s not limited to fashion content. Companies such as IKEA, Airbnb and even Sharpie encourage customers to share their images which, in turn, offers the brands a wealth of authentic content to use themselves. Here at South Coast Social, we understand the importance of UGC, in fact, some of our favourite accounts to follow are ones that manage to get the right balance between brand-created and customer-created content and have us coming back for more. When it comes to our clients, UGC will often play a part in their social media strategies. We work with a variety of brands and, no matter the product or service, we’ve found that the customer always has something of value to add, whether it be a glowing review or a Insta-worthy photo!